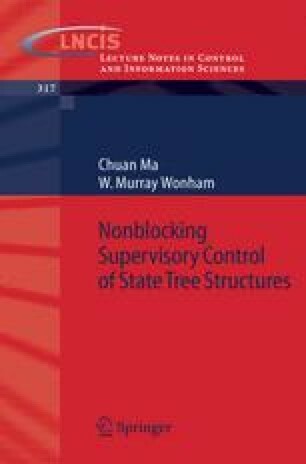 In the previous chapter, we explained how to model a system using state tree structures (STS) and described its behavior by the Δ function. In this chapter, we will move on to deal with the control of STS. The setup of this chapter is the following. First, we compare the state trees of our STS with predicates in section 3.1. Then we handle controllability and nonblocking in section 3.2 and 3.3, respectively. In outline, this chapter follows a similar approach to that of chapter 7 of [Won04]. A new feature is the introduction of weak controllability. With that, the onerous requirement of reachability checking during the synthesis stage can be dropped, with no change in the resulting controlled behavior, but with a gain in computational efficiency for large systems.